Took some time to snap photos of a few new figures that have been holding my interest lately. 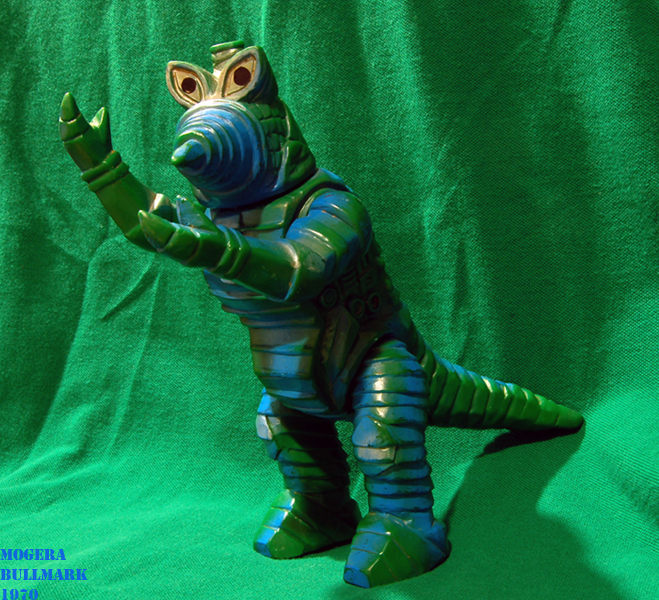 From SDCC 2010, painted by Fig Lab, this Armored Blobpus GID. 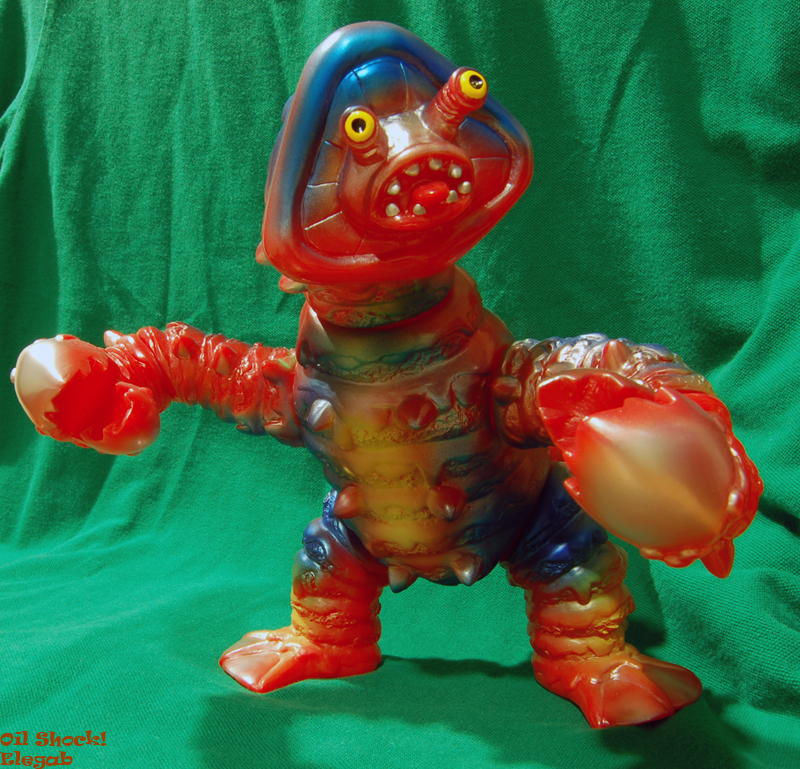 Gorgeous glow vinyl with a special set of resin battle armor for the fearsome blob. SDCC2010 Yamazakura Devil Mermaid. This is the first release of this figure, and I think it’s awesome. Fight figure sized with a great pose, detail, and design! Elegab Oil Shock. Another unbelievable standard-sized kaiju from Nari… huge size, fantastic articulation, and a sculpt jam-packed with detail and character. 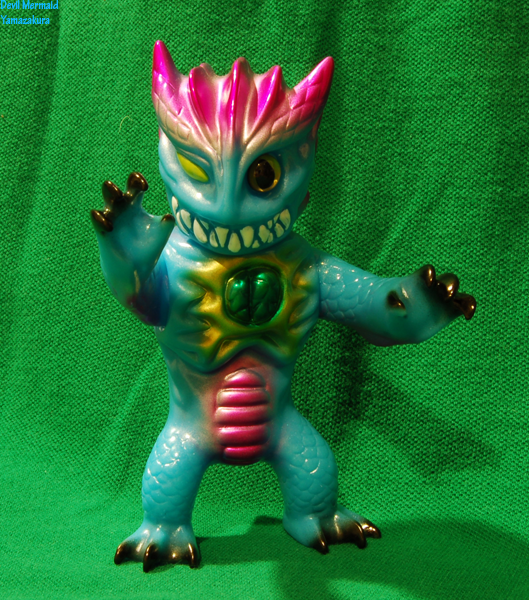 And lastly, the biggest score of my last YJA run… an original Bullmark Moguera, my favorite kaiju sculpt, vintage or modern. Having this figure in hand is just surreal… you can see tool marks in the sculpt, and it is very clearly a handcrafted figure. It also has foot writing, a dividing factor among vintage collectors. It was common practice for kids to write their names on the foot of their vinyl figures back in the day, so they knew who’s figure was who’s after a big battle in the sandbox. Some collectors prefer un-marked figures for their mintyness, but I would rather have a marked figure, because it gives the figure a little more history, and I know that the toy led a long and successful life as a child’s plaything before becoming an object of adult collectors’ lust. What’s funny about my particular figure is that, instead of a child’s name, the foot is actually marked with ‘Moguera’, the character’s name… someone way back labeled the figure, maybe so the kid wouldn’t forget its name? Who knows, but it’s a wild little facet of the toy’s history. « E.killer Fant Art by Josh Bernard!